Special occasions call for a special setting. 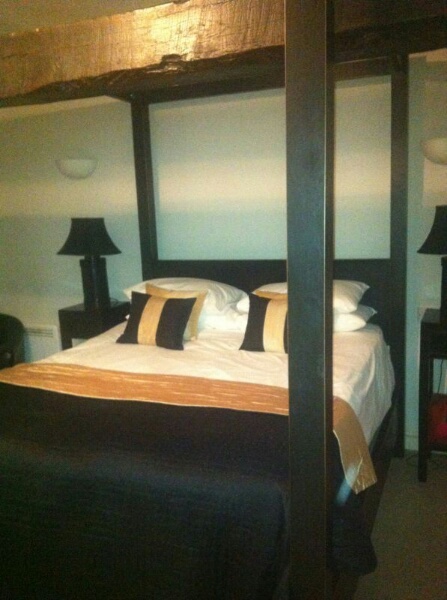 Located in the village of Ewen, near Cirencester The Wild Duck Inn is ideally located for the perfect country retreat. There are National trails within one mile, as well as the Cotswold Water Park, where there are an array of activities including kayaking, punting, and water zorbing. We went on the pedalos, during our stay, which were a lot of fun. You can also use one of the outdoor BBQ stands, and the water park boasts one of the UK's largest inland beaches. Ideal for an escape from the city and because of the proximity to Birmingham and London, the Costswolds are ideal for Midland and Southern city dwellers. South West, not too far from Bristol. 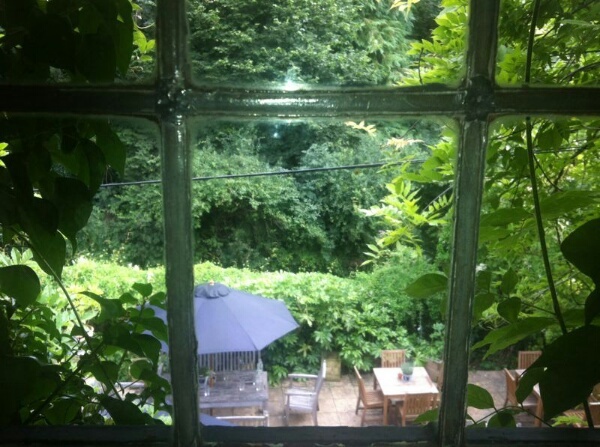 The Inn is a twelve-roomed bed and breakfast, that was very much a gastropub meets luxurious country house. We arrived and examined the room, which was up to scratch; modern and chic, with hints of the Orient, like the large golden Buddha head used to decorative purposes. 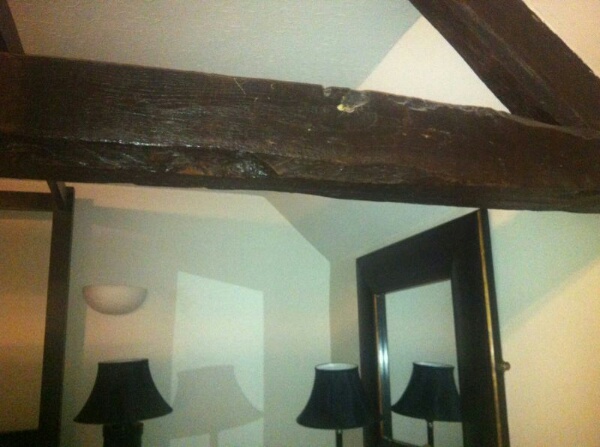 Gorgeous dark wood beams, intertwined with the four poster bed. It was just what we were hoping for; a true countryside, luxe experience. The room was complete with normal amenities, (Tetley) tea, coffee (Nescafe Gold Blend), and enough brown and white sugar. There was only a trouser press, no iron, but it made my trousers crease-free. The bathroom was a spacious room of slate tiles floor to ceiling, with a large, sumptuous bath. Because it is more of an inn-meets-bed and breakfast, they don't technically offer room service, but they did bring up dinner to our room, when we asked for it. The Wild Duck Inn is literally out in the sticks. Aside from the free wifi throughout the inn, we were cut off from the world because there was no signal. My kind of bliss. The food was divine. When we arrived in the afternoon we ordered straight away: Goats cheese with pine nuts with tomato salsa. Unassumingly presented it looked small, but it was filling. My partner ordered the tex-mex chicken: buffalo wings, chicken breast, chips and (what looked like home-made), coleslaw, and a small pot of chilli con carne - a man sized meal. We opted for chocolate brownie sundae was for dessert, and the staff were very accommodating – we requested no ice cream, but because they said it was already chopped up, so instead they gave us extra brownie and chocolate sauce. A Continental breakfast was included in the price; cereals, toast, local cheese, jam and ham, fruit and yoghurt, but we my partner also ordered a door stopper sandwich (typical, hungry man). As our second day came to an end we dined again in the restaurant of the inn. For two steaks, a portion of chips and a bottle of Prosecco we paid £20. The peppercorn, and mushroom sauces were an extra £3.00, as were the garlic mushrooms.They happily swapped the Prosecco, for a soft drink, and a shot with a mixer (rum and coke). They bought dessert up to the room, too. Sometimes a plush hotel room and fluffy pillows are all you need to unwind. Our bed was twice as high as a standard bed, and our view was breathtaking. It was a lovely two days, and I can't recommend The Wild Duck Inn enough, the surrounding area being doubly inviting.